Easter is the celebration of what hope really means. In Jesus’ triumph over death through His resurrection, we believe that death was defeated and hope became the expectation of eternal life with God.Hope is the great driving force in many of our lives, and it has been the driving force in our country’s history. America has always had a strong sense that God’s providence is abundant, that no challenge can ever be too great and no enemy too strong. It was this hope that inspired us to carve a nation out of the wilderness, to appreciate opportunities to responsibly utilize nature’s resources, to engineer skyscrapers towering over our gleaming cities, and to fly to the moon. On Easter Sunday, Christians all over the world celebrate the resurrection of Jesus Christ, an event that changed the course of human history for time and eternity. Because He lives, we can live also! This poll has recorded a substantial number of votes which makes the result all the more striking and emphatic. 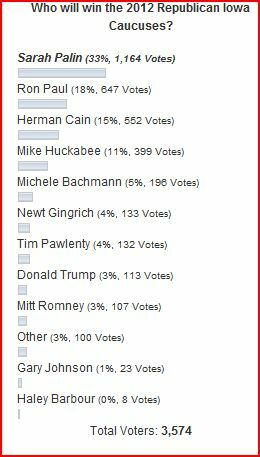 However, as totally opposed to the current media meme that Palin is “finished, cast aside for Trump the result mirrors, time and time again, the poll results from other major sites where GOP activists congregate.